Fiberglass used in transit systems offers a long-term solution for corrosion and maintenance issues. 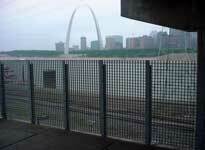 The Bi-State Metro Link in St. Louis, Missouri, replaced its steel windscreen and benches with FRP. Pultruded product offers protection from painting, peeling and unsightly scratches. When made of the typical material, steel, the structures have to undergo yearly painting as well as graffiti removal. FRP requires virtually no maintenance and graffiti can easily be cleaned from FRP with a bleach/solvent solution. 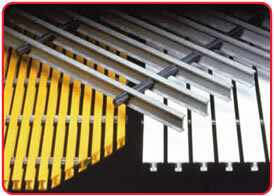 Impact resistance and non-conductivity also provide significant safety gains versus steel. 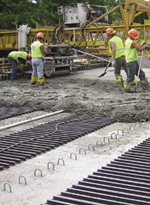 FRP products have proven invaluable in mass transit construction. FRP products have been used in an 8-mile, $1.5 billion commuter rail system that connects New York City with JFK International Airport. The project utilized approximately 100,000 feet of fiberglass protection board to cover the railways' electric third rail. 31,000 linear feet of SAFRAIL™ were installed along with 700,000 square feet of DURAGRID®. From third-rail protection boards and buss bars to grating and handrail, the non-conductive nature of FRP remains the natural choice when it comes to commuter and worker safety. 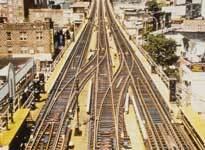 The New York Transit Authority turned to non-conductive FRP when it had to replace 174 miles of elevated wooden train-track walkways. The added safety features of FRP simply outnumbered that of wood. The wooden walkways were treacherous when wet, causing maintenance and safety issues when moisture came in contact with debris. One of the benefits of FRP is that it is engineered with opened spaces, allowing debris and moisture to easily pass through without any long-term buildup, ensuring better traction. The pultruded grating was shipped in safety yellow and will never need painting even when placed in contact with multiple years of exposure with de-icing salts, urban pollution, impact, and chemicals. Fiberglass decking can be used as a long-lasting and lightweight concrete forming system. In Black River Falls, Wisconsin, 2,400 square feet of interlocking decking panels were installed upside down and did not have to be removed as wooden forms would, resulting in a much faster installation. 1.5 miles of catwalks and platforms replaced timber structures for the Port Authority of New York and New Jersey. 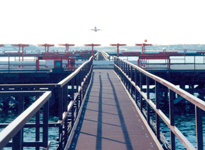 Switching to FRP saved the Port Authority over $16.5 million in expected maintenance costs over traditional materials due to FRP's ability to withstand the the saltwater environment, bird droppings and jet exhaust. The six maintenance personnel previously assigned to maintain the previous structure were all reassigned to other projects. FRP continues to replace steel in vehicular superstructures as it did in the Chamberlain Bridge in Barbados. Structural shapes and plate and building panel systems were used to maintain the aesthetic appeal of the once-obsolete bridge, while allowing the operators to maintain the old lifting mechanism for single leaf bascule bridge. The bridge was shipped in four sections and was assembled on site with adhesives and, toggles, and 3-way connectors. The bridge will easily outlast its steel counterpart for years to come in the corrosive saltwater environment.